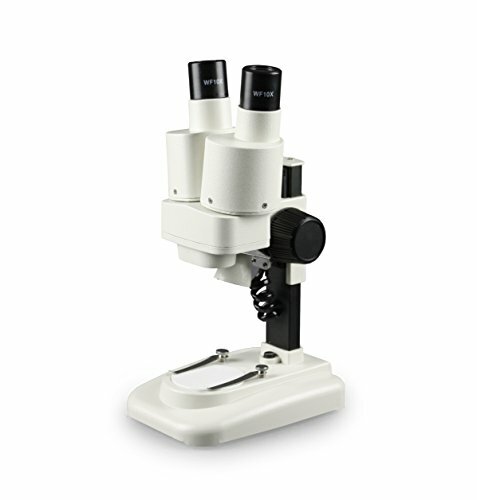 This entry level stereo microscope includes an interchangeable pair of eyepieces: WF 10X and WF 20X. It includes an upright binocular head and interpupillary adjustment of 55-75mm. This stereo microscope delivers a 3 dimensional, un-reversed image with great resolution, brightness and clarity. With a long working distance of 2 3/4“(70mm), it is easy for the observer to manipulate the specimen on the stage. The white stage plate provides sharper contrast and ensures optimal viewing. Packed in a fitted Styrofoam box; includes a dust cover and instruction manual. 5-year limited warranty excluding bulbs. If you have any questions about this product by Vision Scientific, contact us by completing and submitting the form below. If you are looking for a specif part number, please include it with your message.